Is it apparent yet that I really like Kid Icarus: Uprising? Sakurai’s team and the localizers at NOA have done a great job in making Pit into one of the most endearing Nintendo characters in a long time, and the same goes for the rest of the personality-filled cast of the game. 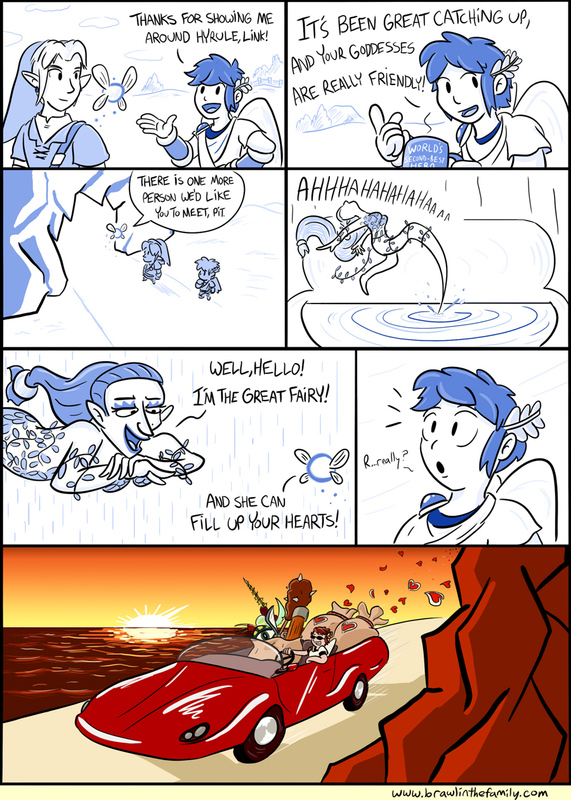 But let’s be honest, most of those hearts that Pit’s hauling out of Hyrule are going straight to the Intensity Cauldron. Those 9.0 runs aren’t going to conquer themselves! The Great Fairy from OoT/MM sure is weird-looking, isn’t she? Really, what were they thinking with that one? I’m a much bigger fan of TWW’s Great Fairies, which are weird-looking, but in a mystical, cool way. In honor of Matthew’s birthday and his impending marriage, we are currently having a 10% off sale in our online store! Go check out our great stuff and use the coupon code “10offsale” in your shopping cart to receive the discount. This sale ends May 28th!